1961; 268 pages. Genre : Contemporary Lit. Overall Rating : B. On the surface, Harold W. Campbell is a World War 2 "Lord Haw-Haw", an American who broadcasts propaganda for Nazi Germany to the Allied soldiers fighting in Europe. Only a select few know he is actually a hero, a double-agent transmitting vital war secrets via coded phrases in his radio diatribes. It's Vonnegut; it rocks. There's a fascinating storyline, superior writing, and a bunch of interesting characters, most of whom turn out to be not what they seem. Vonnegut gives us the moral on the first page of the introduction : "We are what we pretend to be, so we must be careful about what we pretend to be." A couple pages later, his dedication to Campbell reads, "a man who served evil too openly and good too secretly, the crime of his times." There's a brief reference to a great, obscure historical figure - Tiglath-Pileser (pg. 4), and a cameo appearance by one of my favorite words - susurrus (pg. 177). Oh, and I swear each of the 45 chapters ends with a storyline "twist". Try pulling that off every 3 or 4 pages. Underneath all the absurdity, Vonnegut examines a fundamental question - what constitutes the "real" you? Is it your innermost being, or is it the summation of the effect your actions have on Humanity? If the theme of Slaughterhouse Five is the senselessness of war; then Mother Night is its sequel, with a theme of the senselessness of post-war. MN is not quite up there with S5 and The Sirens of Titan, but it's still a superior book, and highly recommended. "Any news of my parents?" I said. "I'm sorry to tell you-" he said, "they died four months ago." "Your father first - your mother 24 hours later. Heart both times," he said. I cried a little about that, shook my head. "Nobody told them what I was really doing?" I said. "Our radio station in the heart of Berlin was worth more than the peace of mind of two old people," he said. I read Slaughterhouse 5 in high school and enjoyed it, but barely remember it now. i've been looking to read more Vonnegut, and recently saw someone review Galapagos, which sounds right up my alley. I'm hoping he's another author I can get really excited about. i read Galapagos about 10 years ago, and didn't like it. but at the time, my only previous Vonnegut reading was Breakfast of Champions 20 years earlier. i don't think i was grasping Vonnegut's style. i need to go back and try it again. It was published like 20 years after Slaughterhouse, it's possible his style changed and the later stuff isn't as good, but I thought I'd try it. One good one: So, of course, I looked at it every time I was left alone. There were pictures of men hung on barbed wire, mutilated women, bodies stacked like cordwood - all the usual furniture of world wars. And probably my favorite was in the introduction: There's another clear moral to this tale, now that I think about it: When you're dead you're dead. And yet another moral occurs to now: Make love when you can. It's good for you. I knew from then on, I'd like this book. I can't wait to read his others. Amanda - i remember while reading Galapagos getting all confused by the time-jumping, and not having any idea who Kilgore Trout was. now that i've read other Vonnegut books, those problems should be gone. Lula - Mother Night had a bunch of great quotes, didn't it? i marked about 15 of them down as i read it, then had to go back and pick just two. that wasn't easy. Hi, Lula O! I must admit that I haven't read a novel by Vonnegut. But I think I'll read Slaughterhouse 5 next year, since I'm planning on staying away from popular novels for the meantime in 2010. This is one author I need to read. So many have enjoyed his books. I wonder if I'll like his style? I like the idea of each chapter ending with a storyline "twist" - it would be quite interesting. I've never read Vonnegut and I'm unsure about it. i'm drawing a blank as to some other author to compare Vonnegut to. any ideas, Lula? 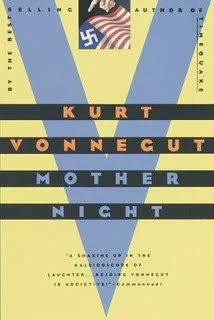 i wouldn't recommend Mother Night as the first Vonnegut book to read. Slaughterhouse Five or Sirens of Titan are good choices. the problem with Vonnegut is that his novels almost never follow a straight timeline, and they often have characters in them from previous Vonnegut novels that he assumes you're familiar with. Ah, I just finished this. What a great book! A surprise ending too. A good comparison? Since I've just read a Joseph Heller, I'm thinking he's similar to him, but Heller was a little bit funnier. Neither really follows a timeline, both fill their novels with great oddball characters, and both have a sardonic wit that is both funny and sad at the same time. And Peter you're staying away from popular novels? Wow, good for you. I wish I could do that, find some little gem that no one else knows about. Hey we actually just read this for our first book club! Would you mind if I included your review in a list of links? This novel was so amazing. The 2nd time reading it every line just stood out to me like BAMMN I am a literary god. actually, i was supposed to be at your discussion (as Rex the Sheepdog), but had computer issues over the weekend. you're certainly welcome to link to my review. thanks for the reminder that I need to read vonnegut! glad you liked this one too. excellent thanks. yea sorry you couldn't make it. Hope to see you for the next one though!